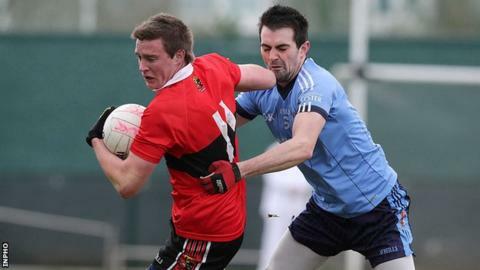 UUJ are out of the Sigerson Cup after losing their first-round game but St Mary's University College have progressed to the quarter-finals. There was no way back for Jordanstown at Parnell's in Dublin as UCC hit an opening unanswered 1-11 and eventually clinched a 1-14 to 0-9 victory. UCC played with a big wind advantage in the first half and led 1-13 to 0-2 at half-time. St Mary's beat IT Tralee 1-15 to 0-9 with Tyrone's Peter Harte hitting 1-5. The Ranch fought back from 0-4 to 0-2 in arrears early on to set up a last eight tie with UCC. St Mary's took control by half-time as five unanswered scores moved them into a 0-7 to 0-4 lead. Paddy Tally's side continued to boss the contest and Harte's late goal rounded off a comfortable win. In Dublin, Tipperary's Conor Cox scored six first-half points for Billy Morgan's UCC side with Peter Crowley notching their goal in the 13th minute. Those wind-assisted scores helped UCC notch an unassailable and unanswered 1-11 before Tyrone's Conor McAliskey finally opened UUJ's account with two points before the break. Aided by the gale, UUJ dominated the second half but missed chances in the third quarter meant that any slim hopes of a remarkable comeback quickly evaporated. Paul Devlin top-scored with 0-5 for Adrian McGuckin's side with Emmet McGuckian also among their scorers. Queen's were not in action but now know their first-round opposition after holders DCU defeated UL 1-14 to 0-8 in the preliminary round on Tuesday. In Tuesday's other first-round game, Athlone IT defeated IT Carlow 1-13 to 0-6. The quarter-finals are scheduled for 13/14 February with the finals weekend taking place in Athlone on 22/23 February.